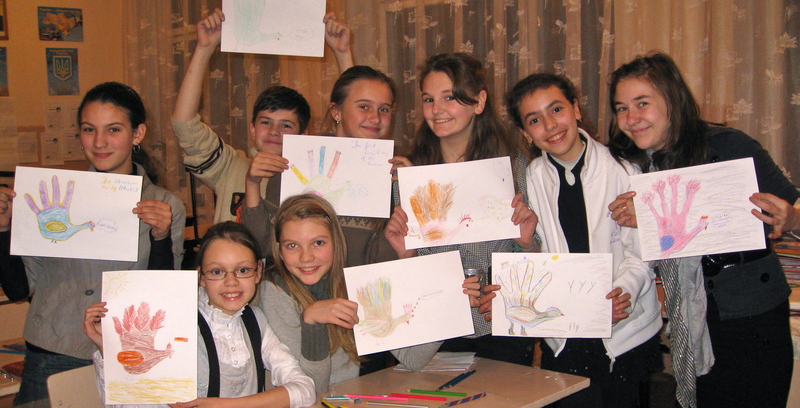 Anecdote: Iryna and Denis (two of my adults; see above) asked me in English club on Wednesday for pumpkin pie recipes. I sent one to Denis online and wrote out a hard copy for Iryna. But she beat me to it! Today, Thanksgiving Thursday, Iryna called me and said, “meet me outside your house in 3 minutes; I have a surprise for you.” Lo and behold, she had found a recipe online and made a pumpkin pie! She had brought me a piece, still warm from the oven. I couldn’t wait to try it and as soon as I had one bite I devoured the whole piece. A great surprise for Thanksgiving afternoon. This entry was posted in celebrations/holidays, community, culture, education, English Club, food, Highlights, language, pictures, recipes and tagged Thanksgiving on 24.11.2011 by taplatt.